A feast of favorites as well as new spring/summer dishes from EXKi NYC. Photo by Yours Truly. EVERYTHING Yours Truly is consuming is scrumptious. Favorite among them, however, is the Marinated Shrimps Tomato Gazpacho. The soup is tomato-forward without being obnoxious, thanks to the smattering of herbs and vegetables restraining the tomato. I can only imagine that the shrimp will take it in the direction of divine. For I do not know because I won't eat the shrimp because I do not eat shrimp and other shellfish – at least not knowingly. A body could not resist the gazpacho, though. Second favorite of the pickings on the tray is the Tunini, a whole wheat wrap of Albacore tuna, Fennel Emulsion, romaine, red pepper, tomato and paprika. I am at the newest location of EXKI, in the Rose Hill (76 Madison Avenue) section of Manhattan's Midtown East, savoring some of the eatery's 11 new spring/summer offerings. 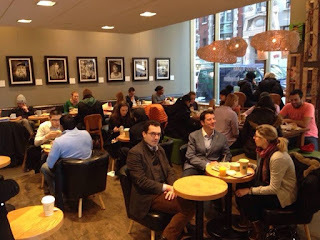 This second Manhattan location of EXKi (the first opened last year in the Madison Square neighborhood at 257 Park Avenue South) opened earlier this year. It is a welcome addition to an area not known for slow fast food, or in EXKi-speak, quick casual. Indeed, a quarter not known for healthy and affordable dining options. The gazpacho is $5.45; the whole wheat wrap, $6.75. Friends and Family Day at EXKi Madison Avenue. Photo from EXKi NYC Facebook page. 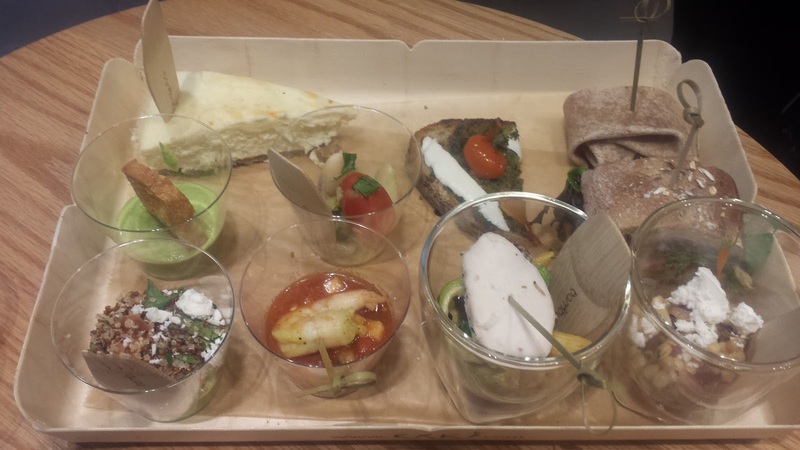 Founded by three Belgium college chums in 2001, EXKi fashions itself as an eatery that sources fresh local seasonal. Its name is a play on the French word exquis, translating to exquisite or delightful. 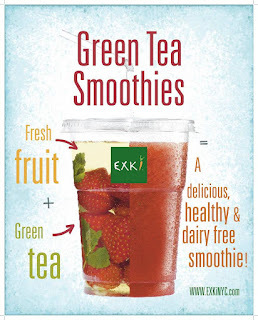 It is delightful that EXKi practices sustainability at its 78 European locations and the two in the New World. This best practice carries over to its menus and serving vessels. All are sourced from recyclable, biodegradable products. In other words, no plastic and other landfill fodder. On this tray, Fen Beans are also impressing the palate. The combination of grape tomatoes, giant beans, fennel emulsion, pickled onions and parsley is flavorful and filling. Incidentally, the fennel emulsion is one of three newbies. They are healthier alternatives to the mayonnaise and dressings meant for sandwiches and salads. Though they are 80 percent vegetable and low in fat, they are reportedly full of favor. The other two emulsions are Red Pepper and Ginger-Miso. Of course, the EXKi spring/summer menu will retain some perennials, including Omega-E, a sourdough tartine of MSC smoked salmon, cucumber, tomato, dill and baby arugula. Another is the antipasta salad, Po Valley (linguini, all-natural smoked turkey, parmesan and baby arugula). On the breakfast menu are Classic Croissant, Steel-Cut Oatmeal and the Egg White Kale Bacon Frittata, among others. To quench the thirst one might opt for organic and fair trade tea and coffee, as well as wine (red, rose and white from Long Island's Bedell Cellars or the south of France). New for spring/summer are nearly two dozen Green Tea Smoothies, which can be gluten-free, dairy-free and vegetarian. All have a base of a fruity green tea from Palais des Thés. Among the offerings are Tropical Kick, Mint, The Amazon, Strawberry, Spa Relief and Cucumber. The Strawberry Green Tea Smoothie is dairy-free. Photo from EXKi NYC Facebook page. Elsewhere, the sweet tooth might fancy the Belgian Cheesecake. It is a bit of a surprise. I was expecting something much sweeter. Like me, consulting chef Galen Zamarra does not fancy treacly desserts. Instead, the cheesecake is a moist treat with a subtle sweetness that gently soothes the palate rather than pummeling it with sugar. Visit http://www. exkinyc.com/to learn more about EXKi and its spring/summer menu. Perish the Food During a Power Outage? Not Necessarily. LET's see: Poland Springs, check. Organic Soy Milk, check. Organic Red Beans, check. If these items are in that go bag, well done. They are good things to have on hand in a pinch – in the event of a power outage during tornado season, for instance. Keeping on hand a three-day supply of Bottled water, Boxed milk and Canned goods is one of five key doctor's orders from Bob Gravani. He is a professor of Food Science at Cornell University and a spokesperson for the Institute of Food Technologists (IFT, https://www.ift.org/; see video above). An appliance thermometer is a power-outage staple. Archive photo. A second in the event of a power outage, store an appliance thermometer in the refrigerator and freezer. The refrigerator should be at or below 40 degrees Fahrenheit and the freezer should be at or below 0 degrees Fahrenheit. Third, please ensure that the refrigerator and freezer doors remain closed as much as possible. 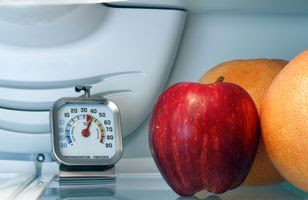 According to BG, a refrigerator can maintain its cold temperature for about four hours without power. A full freezer will hold its temperature for about 48 hours – 24 hours if it is half full. Order No. 4: Have coolers for storing refrigerated foods. Also freeze containers of water, ice cubes and gel packs to use in the coolers. Whether Poland Spring or some other brand, have plenty of bottled water on hand during a power outage. 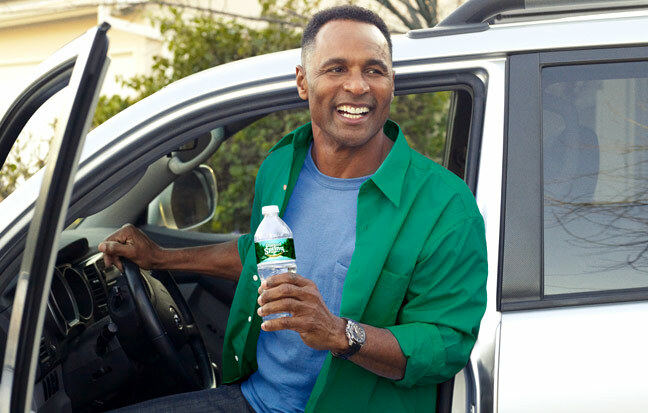 Photo from Poland Spring Web site. Finally – and this is really important – if you are uncertain about whether food is still good, do not eat it. In other words, when in doubt, throw it out.